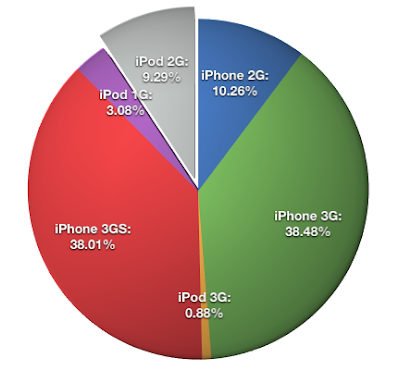 Wow, iPod Touch 1g is only like, 3%? Damn. That's what I use, and I figured there were a lot more than that many people using the same device! @condawgng indeed, yes. It would be the first platform I'd drop support for if I was so inclined, but as long as the 3G is around I'll keep it up. 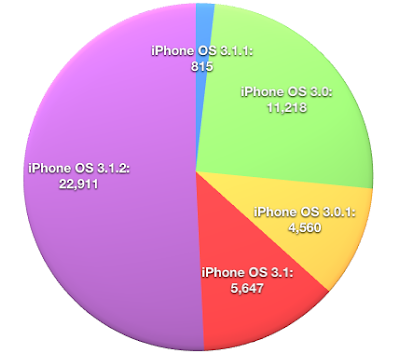 Once everyone finally moves to the faster devices (3GS, iPT3G) then I can actually do some really cool features that would be too slow on the previous gen. Does the update includes v2 as well eventually? Or will v2 be another standalone? Steven why don't you do two separate versions? Or a unique version with some locked features if you are on 3G, iT2g, etc..
Wow, I'm one of only about 400 users with an iPT3. As for features that require a faster device, couldn't they just be disabled for users that don't? (By "disabled", I mean not loaded into the RAM). Question: for some reason, even though I have a WinterBoard theme applied, Orbit shows some of the icons on some of the pages as default icons (App Store, iTunes for example) but other icons are shown as icons from my theme. Is there a reason for this? The icons show up as all themed on my SpringBoard. @Max the reason is because your theme hasn't actually themed the small versions of the icons (which Orbit uses). Let themers know they need to think about the small versions too, and then you'll start to see them work properly in Orbit (and Spotlight, and anything else that uses the small version). There is no way for me to use the large version of the icons without killing performance and RAM unfortunately. A fantastic app, but sometimes the pages are duplicated. Closing and reopening sorts it but it makes it kind of hard to pick the right page. What happened to 1.1 promised for this past weekend? The more I use it the more I see the incorrect page images appearing or page images duplicated. Having said that, I'm sure it will be sorted with 1.1. I can't remember the last time I flicked through half a dozen pages to find the one I want. I'm sure Apple will pinch this and implement it in the future. Really looking forward to home button function. Great work. I really like the application. Its really better than its previous one. It would be much better than the others of its range. sane question as @Dante and @falvesjr.. I bought this app when I read home button support was coming and am holding my breath in anticipation for the release.. Waiting on 1.1 also, i will use it a lot more when 1.1 is released? any news when? If you wont release Home Button support can you at least give us an indication of how to use Custom HomeButton to have this open with double tap? iPhone 3GS potions will grow-up, even more if the $99 3GS has launched at Christmas. Yes, it's frustrating waiting for the upgrade, but I would rather it was 'right' than rushed out. In the meantime, Steven, could you at least let us know that you are still out there and working on it? @Rob a lot more has gone into v1.1 since home button support was planned; I'm waiting on artwork to come for these new features before I can release (as you'd expect). Sorry you have to wait, but c'mon, it's a $2 app that works great already. I just downloaded Overboard from Cydia. It seems to do all that Orbit intended an does it well.